At Fairyhill, we know that one day just isn’t enough when it comes to your wedding. It's one of the reasons why we offer our happy couples and their guests a stunning selection of wedding accommodation options. This not only allows the celebrations to continue for as long as you want but also adds an extra dimension of style and elegance to our luxury wedding venue. 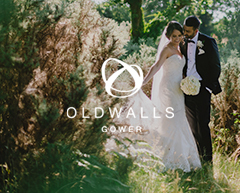 Within a five-minute drive of both Fairyhill and our sister wedding venue Oldwalls, these perfectly-picturesque luxury cottages can give you and your guests unforgettable memories before, during and after your wedding day. Sleeping between 8 and 11 guests over two spacious floors, Cerrig Glan offers two luxurious double bedrooms, two twin bedrooms and a dressing room. The annexe also adds some quirky bunker-style accommodation, complete with three ¾ beds. But before bed, guests can enjoy spectacular views in the sheer luxury of the Jacuzzi hot tub and heated outdoor pool. Sleeping between 8 and 12 guests, Mulberry House offers one floor of open-plan living. There are three luxurious en-suite double bedrooms and three double sofa beds in the stylish living area of the cottage. Plus a stunning kitchen, which serves as the hub of the house. Epitomising the class and elegance that our brand is known for, Mulberry House has its own private terrace and hot tub, allowing guest to enjoy the spectacular views in sheer luxury. For maximum comfort, you can also enjoy complimentary Wi-Fi, Sonos music system and Sky TV. Book one of our Rustic Retreats the night before the wedding so that both the bridal party and the groom and his guests can look forward to a stress-free morning. Just minutes away from your wedding venue, they also make stunning locations for those candid morning-of-the-wedding photographs. On the night of the wedding, our cottages can offer additional accommodation for your wedding guests. But it needn’t end there. Hire them the day after for some post-event celebrations, from a barbecue on the terrace to a garden party or drinks indoors.